back in the late 60's i was a student at a tech school in Indianapolis. during the month of May i spent every free moment at the speedway. one of the earliest day's at school some of us students were sitting around discussing some small trivia question about racing and no one had the answer. i said 'hey wait, lets call that guy that knows everything about the 500'... so i did. Donald Davidson answered the phone, i asked him my question (what year did Spider Webb race or something) and he not only told me the answer, but the car he drove, the number, the lap he went out on and why!! wow... well he was only 24 or 25 at the time, and was impressed with my question and invited me to have lunch with him. while at Indy as a student, we schooled 1/2 day and had a job the other 1/2. my job was at a Consulting Engineer firm in downtown Indy, 9th floor of the Roosevelt building. i parked several blocks away, and would walk in. one afternoon i was pretty much alone when i reached the corner to wait for the traffic light to change i was aware (a rarity in itself) that there was someone standing next to me, also waiting for the light. i looked up and then did a quick double take as i thought the gentleman looked familar... and it was! DENY HULME... so here i am, 18 years old, on a street corner, in 1967, and there next to me - all to myself was this racer. we cross the street.. but the kicker is i don't remember anything after that. i don't remember crossing the street or if he vanished in thin air! my advice? have a question in mind should you ever have the rare chance to find yourself alone with one of these guys, to at least start a conversation. i'm sure the rest of conversation will flow, but its the initial ice breaker that will forever haunt you if you don't. again the briefest of story, but the emotion of it remains as clear and fresh as if it were yesterday. this time its 1968.. early May.. very relaxed atmosphere. 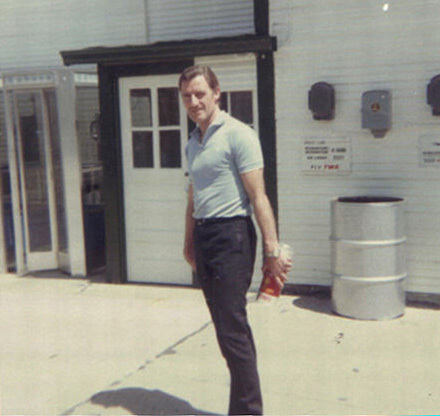 in those days, you could walk between the pit gate, and the garages (that space is called 'gasoline alley') and often catch a driver in his street clothes and not surrounded by people wanting an autograph or interview. Sometimes they'd be in driving uniform, or their way to the car or back from a run. today it was Mike Spence, walking alone, and when i called him out, he seemed pleasantly surprised to be recognized. i told him i followed F1, and we had a nice chat standing in the sun, about traveling, being away from home, the 'thrill' of racing, and the significance of Indy to people of the US as compared to the Euros' and it being 'just another race' (except for the last place guy in the 500 getting more prize money than any winner of and Grand Prix race!) - i dont recall the last thing we talked about, but it was cool. he was in his early 30's i was 20, maybe it was the moment, maybe because the day was so perfect. the sun was out, it was only practice... what ever, but one of his crewmen came over and said 'hey Mike, car's ready, lets do some laps'. Mike looked back at me, we shook hands, he said 'thanks' i wished him good luck and said i needed to get to work. we parted. it took about 15 minutes to walk to my car parked in the infield, but you can hear the cars on track from about anywhere in the infield, especially if there is more than one on track. i felt good. a glow from the conversation with a real driver, the sun warm on my shoulders. i was driving out of the track on my way downtown to work listening to the radio that broadcasted from the track, all day, live, when they announced that Mike Spence had just crashed. 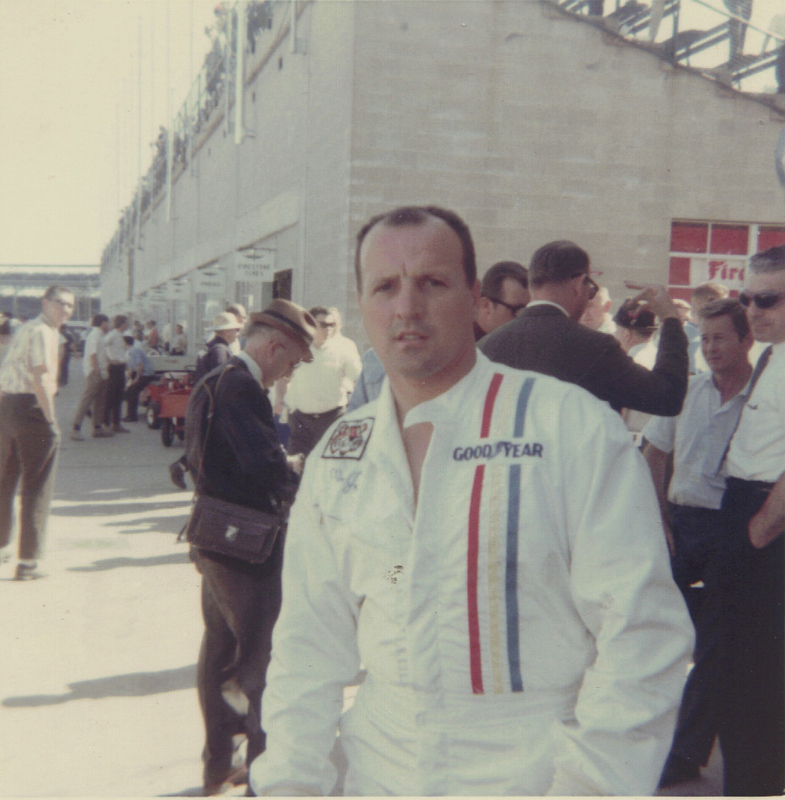 i had just missed Graham Hill walking from gasoline alley into the garage area, but he was still close enough to call out to him, but he was behind the fence that separates the 'throng' from the mechanics & drivers, allowing them some privacy and quiet. dressed in slacks and pale blue polo shirt, Graham was carrying 4 (or 6? i'll have to check my photo) cans of motor oil (yes he wasn't' just a pretty face). he had the cans stacked, 2 cans in each hand and was walking them to his garage when i called him. he stopped when i requested a photo, but said 'hold on' and then proceeded to turn his arms, and place the cans behind him so they would tarnish the picture i guess. there he stood while i snapped my instamatic, capturing the moment and the memory of the exchange. he'd never heal. so he tells them like this and holds his hands in front of him, each in the shape of a letter "C" when they asked why, as it would be difficult to do some simple tasks (like opening a door) in that configuration he replied 'so i can grip a steering wheel. well when i got my chance to step up and get his autograph i witnessed him signing my paper placing the pen between the first two fingers, looking more like charred sticks and moving his entire hand to sign, then remove the pen with the other hand to return it to me. if you ever get the chance read his story. autographs? yeap... i got my share. but being close to these 'men' was often enough. there is something about them that charges the air with greatness and purpose. it can be sensed. a drive. i don't recall what i imagined, but i know it was a couple years later that i learned there was more than just 1 race. an entire season of races and i was hooked. that year i was in school and didn't buy a ticket. i usually went home on the weekends to see my girlfriend. the drive was about 3-1/2 hours. and instead of driving back late sunday nite, i'd stay home, get up early monday and drive to Indy, hang a left at Keystone and go straight to school. well in 67, the race was held on Sunday, but after 18 laps was red flagged due to rain. postponed till monday. As i drove to Indy i tuned into WIBC to listen to live trackside reports. there was a lot of confusion and a lot of people that had been there Sunday needed to leave to be back at their own jobs on monday. as i approached the Keystone turnoff they announced that my school was CLOSED!! so instead of left i went straight to the track :) (this was before the 465 by-pass so i had toward downtown and hang a right at 16th street. As bought my $5 infield pass and was about to drive into the track (under the track thru the tunnel) i hear that the call that cancelled my school was a prank! well its too late to worry about that (i had spent $5 bucks already!) today that same ticket cost $20 i think. anyway, i was there, my first race and i wandered about the huge infield looking for a place to watch from. everything was soggy, muddy and dirty. trash was everywhere. cars were few and the attendance way down. it was more like a practice day than race day! A CAR SIDEWAYS! coming out of 4 he has spun sideways...and is broadside to the track, its surreal - slow motion, and then just like on TV every thing starts speeding up, cars are bouncing spinning sliding, a tire goes rolling by, a car makes contact with the outer wall, and the flash from the magnesium wheel catches my eye, debris everywhere...pieces of cars, tires.. (and this is before carbon fiber shreds) you become aware of the announcer screaming - where's FOYT? where's AJ? was he involved? will he make it? all heads are scanning T4, the debris, the wounded cars scattered all over the straight and then.. here he comes! out of 4, about 30 miles per hour.. weaving his way through and around the disabled cars and drivers standing up or on or next to their cars, and AJ is waving to the crowd as he takes the checker! i was completely blown away... how can this ever in my life be topped (that question would be answered about 10 years later when i met the woman of my dreams) - but at the moment of AJ Foyt winning that race, the rest is gone. i dont remember leaving my seat, how i got to my car.. or the rest of the day. its as if the film stopped. i dislike Tony George for what he's done to the tradition of the INDY 500 , his ego has spoiled what was once the 'greatest spectacle in racing'. but my memories of the past, and the new race fans will never know the difference, and eventually the 500 will have a whole new support base. but 1967 for me will never be surpassed. its why GPL, 1967 is so near and dear. when i launch it, I'm 19 years old again, and racing with many people i only admired and revered then. in those day's no INDY car had on board starters, but the F1 cars did. 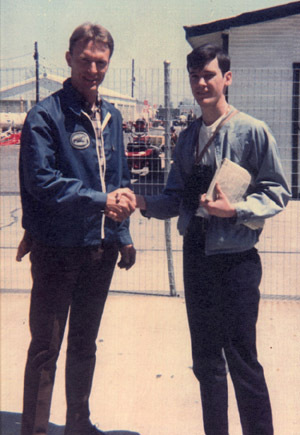 Jochen was to be driving a brabham/repco if memory serves. the restrictions at indy are very tight, and all drivers (then) were well indoctrinated unless they preferred a stiff fine. one of the 'rules' was cars were pushed between the garages and the pits , and not to be under their own power unless in either of the two 'safe' areas. i was in the main grandstand on this practice day, just to the right of the space that the cars were pushed to go into to the pit area. a few cars were already on track, so the sounds were BA-rauwwwwwwww past the main stands, or the distant waaaaaaaaaa that you heard, knew and could tell where the cars were on track. in between the noise was a quiet space. when like breathing, the exhale of quiet allowed a moment of conversation to some one nearby. you could almost time a subject matter, because of the spacing of the cars, you knew you had about 30 seconds before they'd roar by again.. when suddenly BA-RAmMMMM BRAAMM-BRAMMM exploded to our left!!! what the ...?! brauwwwww BRawAAA BRAWNnnn and there he was, Jochen had started his car, while being pushed, in the gasoline alley approach to the pits! it was GLORIOUS! the sound reverb in that concrete walled space between the north and south grandstand had probably never heard such a fantastic RIP of engineering. Jochen pulled it out on the pit lane, and promptly tooled out, straight on to the racing surface, hardly pausing for instruction. it was so against all the rules and tradition and anticipation of what we had all become so accustom to - terrifically exciting and never to matched again. 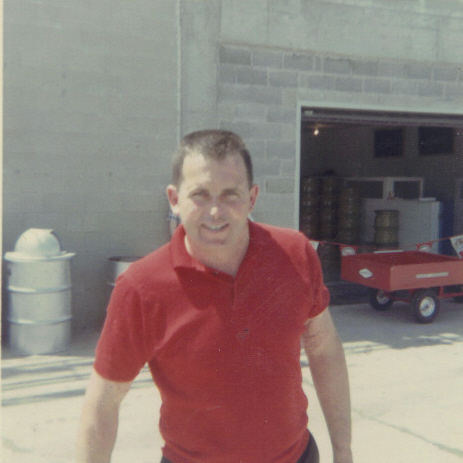 photo of Mr.Gurney and a kid, at Indy.. May-'67 the story behind the photo to follow. later i sent an enlarged copy of it to him and he autographed it. and tho there are more stories (meeting Gil de Feran in the parking lot) they are mostly later events. i wanted to share the ones that relate more to GPL and a time that IMPRESSIONS were firmly emplaced in my brain.